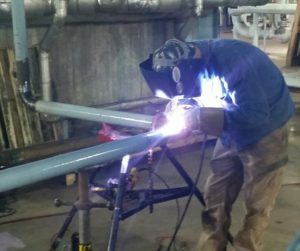 PCM Industrial Services is here to assist you in all of your short turn around welding and repair jobs. We are available for scheduled, unscheduled and emergency maintenance / repair projects and can support a wide range of project sizes. Offer TIG, Mig and stick welding capabilities of both carbon and stainless materials. Offer fast turn around and shorter down time. Ability to work off shifts to accommodate your production schedule. OSHA confined space trained for entry into tanks and vessels. 125 psi fuel-driven air compressor. 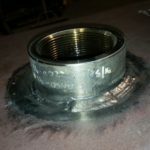 Tooling for all welding (both pipe & structural), maintenance / repair and rigging / erection needs. Modern 110-volt welding “suitcase” capable of Tig, Mig and stick welding processes, allowing for the delivery of welding services in a less invasive manner when required. 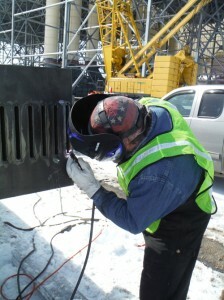 Allows for mobilizing a single welding / maintenance technician, up to a five (5) person maintenance / repair crew. Material Rack for hauling pipe, steel, lumber, ladders. Mobile Rig, including all equipment and tooling provided clean, and maintained in proper & professional working condition. Inspected regularly. State inspected, fully insured and DOT compliant. ASME/AWS certified procedures and by ASME/AWS qualified welders, with adherence to FDA/USDA standards, as required. Our goal is to be as responsive and flexible as we can be while providing you with high level maintenance and repair solutions when you call on PCM Industrial Services, Inc.
Our Altavista location allows us fast access to Routes 29, 460, 501, 40, as well as I-64 and I-81. Call PCM Industrial Services, Inc. at 800-445-4726 for fast courteous service.